A key caveat to this post is that I’m speaking to independent CFIs. If you work at a school, or somehow your money flows through an entity that controls what you can charge, then this article isn’t for you… yet. It very well may be when you are finished reading this article. Where are you? If you live where the cost of living is high, you can’t begin to contemplate being an independent CFI unless you have some firm rules on how stuff is going to work for you financially. If you live in Presque Isle, Maine, you’ll be less busy and may not be able to charge as much. So you have to factor in some basic stuff like – will this area even support what I need? Do I have to move to Portland? (Yes, you might.) More on that with a spreadsheet below. If you can’t make it work where you are, odds are you can not too far away. What are you selling? Time builder? Just got the rating … but pumped about teaching? If that is the case I’d urge you to consider another path to get the time you need. If you enjoy teaching, loved getting your ratings and can differentiate through a teaching style or method then you’d be surprised how much flexibility there is in your rate. If your experience is low, compensate by showing how much extra work you’ve done. Diverse flying such as tailwheel, aerobatics or floatplane experience add to your overall panache. Simply being better: What was the worst instructor experience you had? And how can you help your students avoid that? Being an instructor that realizes how important it is to connect and get your students to engage in a stress and anxiety free way is central to efficient learning. You can charge more if you create an atmosphere where the stuff you impart lands faster and with more gravitas than the instructor who is perfunctory and going through the motions. To summarize, be confident, do some self exploration and tell yourself you are worth more. This isn’t BS. It is true. You are worth more. Alas the math is the most helpful confidence builder. It also prevents financial CFITs. If you are independent and live in a place where you’d like to have, say $62,400 after tax, in your pocket at the end of the year then your next stop if a spreadsheet. Charge a 3 hour minimum. That’s right. Each lesson will be designed to get them as much bandwidth as possible, including “take home” stuff that will save them time (and money.) They will chair fly, read and study. When together, you might spend 45 minutes getting ready, 1.5 hours in the air… and another 45 min. debriefing and putting the plane to bed / doing paperwork. As a contract pilot I make between $500 to $1200 per day depending on the equipment, client and length of engagement. Once I got used to this, I decided that it would work really well as a CFI. I just “know” that a day is going to be $600 or I line stuff up for another day. Do two students a day. A morning block and an afternoon block. That’s 6 hours split by maybe an hour or two unpaid lunch period you can use to get your head ready for the next student. Doing more than two a day is possible, just be mindful of eating properly, fatigue, etc. Double up. I also call this “Copy Prince.” Prince Singh (www.cfiacademy.com) is a veteran instructor of instructors. One of the most ingenious methods he employs is having CFI candidates teach each other and when flying to put one student in back to observe the teaching. This saves the students money and enhances their learning experience at the same time. Block weeks you won’t work. And be sure to fill up the ones you will. The easiest way to stay busy, ironically, is by saying “no” to the times you need for yourself, family etc. A balanced schedule will make you happier, more focused and a more effective instructor. Sign up and get more magic! 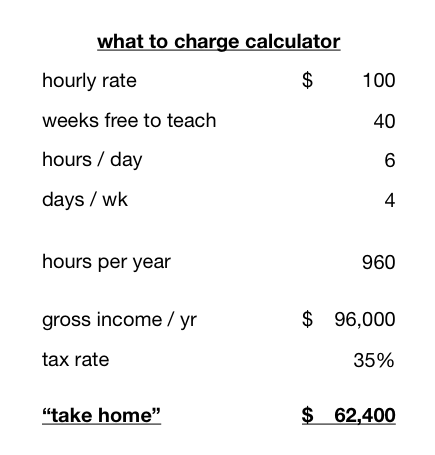 A student would be right to pushback over being charged $100 an hour for instruction. In a 3 hour block there would inevitably be a lot of downtime in between preflighting and breaks. You are charging more than Rod Machado and great instructors like him aren’t looking at their students with 401k’s in mind. You are going to force your students to feel the heavy (heavier with your scheme) financial burden of learning to fly before the early successes that usually propel them to finish their license or rating. I find it immensely more rewarding to pick up an extra trip a month vs charging my students some insane hourly fee. Passing on the knowledge that someone took their time to pass along to you for a lot less than $100 an hour. Michael, I honestly really like your “pay it forward” scheme. Trust me, I volunteer in aviation in Oakland, so I am doing that. But when I’m working I’m working. Think of it this way: If all you did was teach, how much would have have to charge in order to save, pay your taxes, build a marketing presence, buy groceries, etc.? I’ve done that math and it is actually higher than $100 in the Bay Area. Rod Machado is a good example – he makes most of his income on his publications (as I aspire to do) and the instruction is just part of the persona. Like you I also blend different types of aviation income with the teaching. But, I would add, *not one* of my students has pushed back on the price since I warn them (in advance) that I am the priciest at the spots where I teach. Let me know if the above makes sense and seems fair. 150$ on getting ready, debrief, ties downs, log book signing. Lol. I have a hard time believing your students are getting fair value for their money. I can only see wealthy people for whom money at this level is no object, signing up. This reminds me of the ‘check pilots’ at my flight school who give progress checks at 95$/hour for three hours and spend a lot of it shuffling papers, small talk and grabbing coffee and then reading questions straight out of the ASA Checkride Oral Prep book – self inflated sense of value and fortunate enough to be in a position to abuse the power. But that seems to be the attitude that is rewarded these days. You are welcome to talk to any one of my students directly on this. I guarantee you the 45 min. of prep brief and de brief is as valuable if not more valuable than the time in the airplane. As a good teacher once told me “the airplane is a terrible place to be teaching… ” Students tend to be more stressed when flying and absorption is low. So go fly, do the thing you choreographed you’d do, then come back and analyze it and talk about it. Then chair fly the crap out of it.